I am a new parent. Well, I've been a parent for 22 years now but since my youngest was diagnosed with ASD (Autism Spectrum Disorder) in 2016 I feel like I am learning parenting skills afresh. I feel very much like I did when I was a new mum. Before my son's diagnosis I worked for a time as a teaching assistant working with children with a range of needs including some children with what would now be described as ASD conditions. Even so it never struck me the enormity of the impact the condition can have on family life in childhood and into the future, even for those who may be described by some as "high functioning." The other thing I discovered quite quickly is that there are thankfully a lot of very dedicated people working towards better rights, better services and better research into ASD including those at the charity Autistica. 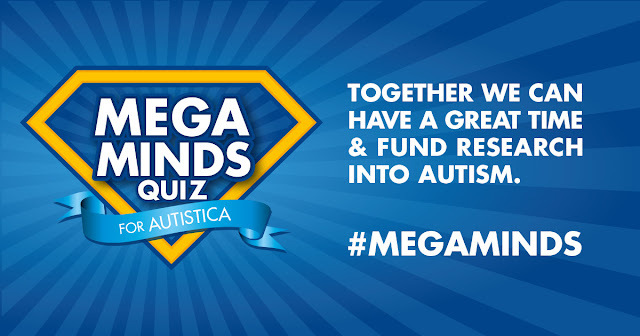 Autistica is a charity, founded in 2004 which funds and campaigns for pioneering research into the causes of autism, to improve diagnosis, and to develop new treatments and interventions. So far they have raised over £8.5 million towards research with the aim of making a real difference to peoples lives. To fund and stimulate innovative research that will lead to improved understanding and better outcomes for people with autism across the lifespan. To be the bridge between people with autism and researchers, ensuring that research responds to the needs of individuals with autism and their families. To provide a place to go for reliable information on autism, promoting knowledge and understanding, and ensuring that autism research informs the delivery of high quality care and support. Last week I was invited for a trial run of their new #Megaminds quiz kit which contains everything you might need to host a fund-raising quiz event - even down to the posters! Now I am rubbish at quizzes. My journalistic mind tends to hold information for as long as I need it to write an article them promptly discards it in favour of the next block of facts. Unless those facts involve Abba or food. I remember the important stuff obvs! I often feel a bit left out when I join quiz teams but I actually found the Autistica quiz very entertaining as it had a great range of categories ensuring everyone can contribute. OK so my contribution was not so much as my team mates who seemed to know lots of facts but I sailed through the brand identification picture round with my tragic knowledge of typefaces. Amazingly our team (me (left) Jax from Live Otherwise (centre) and Erin (right) from Island Bell jointly named "We're Only Here For The Crisps) won the trial quiz (despite me being a member of it) and I was very proud to receive my certificate as a #MegaMind superhero! It's very easy to organise your own quiz at work, home, in the community. Simply find a venue, agree a date and set up a Just Giving page HERE to sell tickets and collect donations. The downloadable pack contains posters to advertise the event, eight rounds of questions, fundraising ideas to make the most out of your event (maybe add a raffle?) and certificates for the winners. "Simples!" as that annoying meerkat says. A staggering 2.8 million people are affected by autism every day and Autistica's research depends on donations from the public. 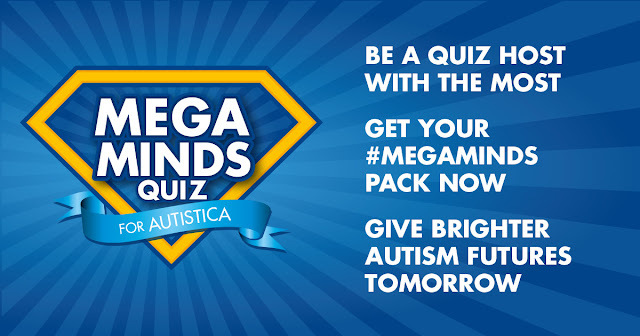 You can do your bit to help fund life-changing research just by having a fun quiz night - go on, be a superhero and download your pack by clicking HERE. I obviously love my youngest child as much as his brothers and sisters. I want the same for him as my other children. Like most parents I just want all of them to be happy and healthy. I dream of a day when research might find a way to ease my baby's many autism-related anxieties making life easier and happier for him. I pray for awareness to increase so I don't have to constantly explain why yes, my son can make eye contact and chat but still, in the words of the experts who assessed him, he is "clearly autistic." In the meantime I will do all I can to support those leaving research and raising awareness - now, local readers who know me in "real life" - who fancies a quiz night?